Here's a fresh, colourful, minimal-fuss idea to get a summer feast or Christmas lunch started. You can replace the scampi with sashimi-grade fish such as hiramasa kingfish or, if your prefer your seafood cooked, use some split prawns, freshly grilled on the barbecue. Remove the tail meat from the scampi and discard the shells. De-vein. Cut in half lengthways and arrange on a platter. 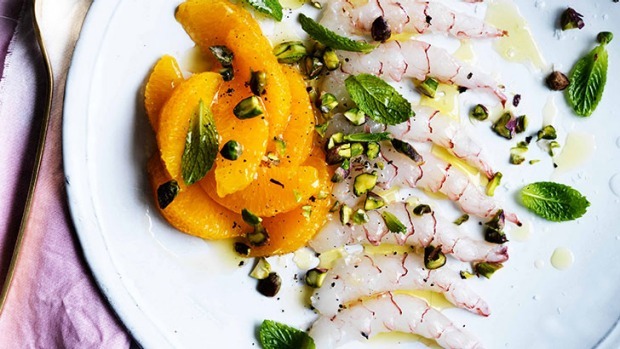 Season well, drizzle with oil, then scatter with orange segments, nuts and mint. Serve immediately.